Boy, I would be so happy if that were literally true if applied to vacations. I am not ready to go home, but tomorrow is the day. This morning we went back to the tunnel Mercado to look for a black “no Army” t-shirt for Mick (C.R. abolished their army in 1948). No luck with that, but we found another booth with great shirts that are hand-painted by the man there and his sons. Mick and I both found shirts there that we liked. Then we walked up Avenida Central to the Central Market, strolled through there, and YES found the black “No Army” shirt that Mick wanted. To celebrate we went to Casa 927 for lunch. 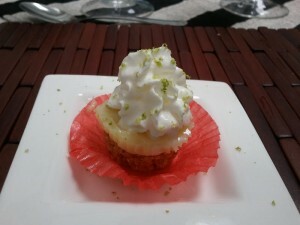 After our delicious lasagne, the chef brought us each out an adorable little lemon tart. On the advice of our friends Gina and Mike, we also stopped at the Auto Mercado and got some Dos Pinos Trits, which may be the best ice cream sandwich either of us has ever had. The rest of the day was pretty low-key. We went back to the hotel, checked in online & got our boarding passes, and arranged for transportation to the airport. Our flight is late enough that we’ll have plenty of time in the morning to eat breakfast and get all packed up. For dinner, we went to JR’s BBQ for ribs. The meat was quite American but the sides were Costa Rican, and the portions were huge. Dessert was out of the question. Now we are watching TV. Mick has become a fan of Telemundo, and he thinks we have it in our satellite package at home. 12 Corazones and much, much more. I am more determined than ever to keep going with my Spanish lessons, so every bit helps.